Kick off your Sunday shoes and join us for dancing, drinks, and radical night! 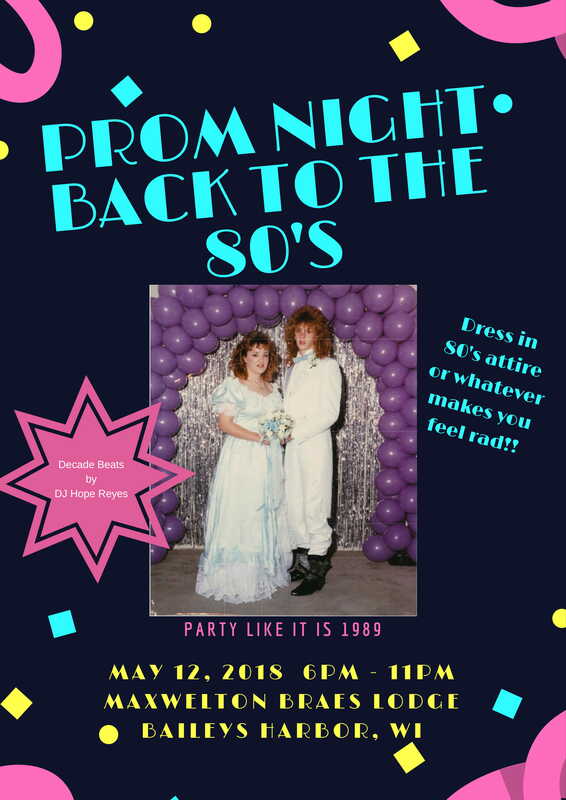 In celebration of neon, Michael Jackson, hairbands, and spiked punch, Maxwelton Braes Lodge and Thyme Cuisine bring you Prom Night Back to the 80s on Saturday, May 12. For one night, Maxwelton Braes will take you on a back to the future, and transport you to a time when Madonna was queen and Motley Crue was king. The evening starts with a spiked punch cocktail hour and guests are encouraged to take their photo prom-style in front of our 80s inspired backdrop complete with polaroid print outs. Attendees are encouraged to dress in 80s or whatever makes them feel rad! After primed for a tubular evening, dudes and dudettes will take to the dance floor and enjoy the decade beats from DJ Hope Reyes and a full bar with gourmet heavy appetizers. Also, in true prom-fashion, a King and Queen will be crowned, based upon the best threads and dance moves! Prom Ticket ($20/person in advance or $25/person at door) includes dance, one hosted cocktail and gourmet heavy appetizers. For those who wish to hang until the sun comes up, Maxwelton will offer a $89 room package to include an evening in a lodge room. Blow out Promo Package: If you really want to impress your date, take them to dinner at Thyme Cuisine. Dinner is $25/person and includes a salad, entree, and dessert. Add on a Lodge Room Package: $89 plus tax for a one night stay.